Celebrating this wonderful decade of love and service, the staff of the hospital had gathered in the Sai Kulwant Hall. The marbled blocks and the adjoining areas were all filled with the SSSIHMS, WF staff. 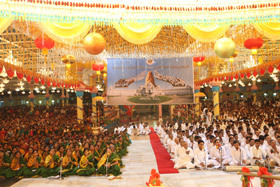 It was a wonder in itself to see so many people with a sense of fulfillment on their faces sitting united in their unflinching love for Swami. 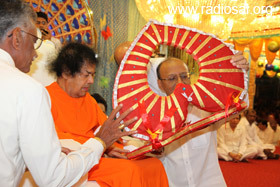 It was at about 6:40 p.m. that Swami emerged from Yajur Mandiram for darshan. 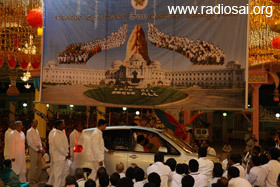 Swami took a complete round in the car and then descended at the veranda. A permanent exhibition has been planned for the hospital and a few representative panels of that exhibition had been displayed in the Bhajan Hall. 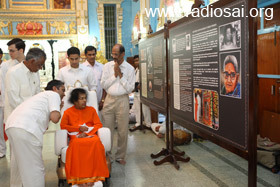 Swami went in around looking at the panels. 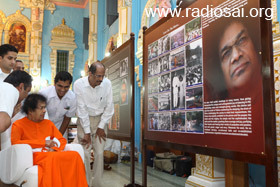 There were a couple of people who explained what was on the panels and Swami was looking intently. Once He completed that round, the alumni staff of the hospital requested Him for a photograph and Swami agreed. After this, Swami moved to the stage outside. 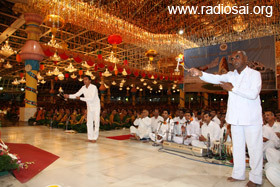 He lit the lamp that had been placed in the centre. 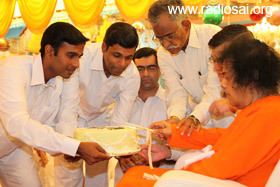 A cake had been placed at the eastern end of the stage and Swami cut the cake to a round of applause. 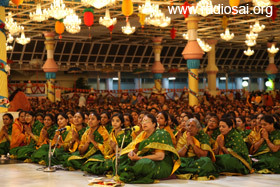 The bhajans were on and Swami sat enjoying them. In between, He read through the letters He had received. A new Cath Lab Project at the hospital with unique features that is ready for inauguration was also blessed by Swami in a unique manner. 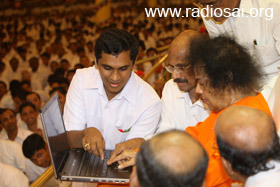 A walkthrough of the same had been prepared and Swami was taken through it via a laptop. Swami saw the short presentation. The Cath Lab has features like ceiling suspended 'c' arm, head to toe scanning, modern flat panel technology, etc. 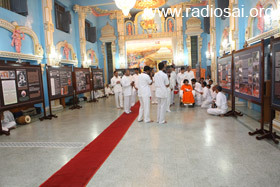 The Director of the Hospital, Dr. A. S. Hegde, then asked Swami if the programme could begin. Swami smiled and told him to wait. 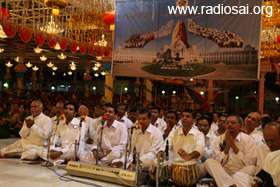 The bhajans went on and everyone was enjoying it. It seemed as if the programme would not materialise that day. 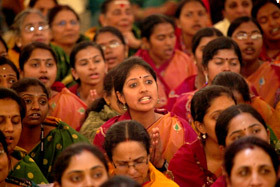 At about 7:20 p.m., Swami asked for the aarthi. 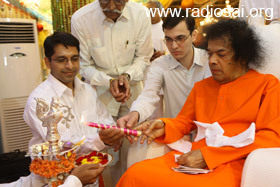 And as the aarthi was taken, Swami blessed prasadam to be distributed. Then, all of a sudden, Swami beckoned to the staff member in the first line and asked him to start the songs. It was with great joy that the programme began and everyone sang their hearts out. As it is said, “Patience seems like a bitter plant but its fruits are very sweet!” That was the experience for the SSSIHMS staff. 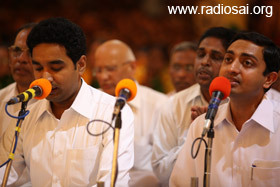 After a few songs, Swami looked and asked, “How many more?” “Two more, Swami” was the answer. He smiled and nodded and thus the complete programme was presented. 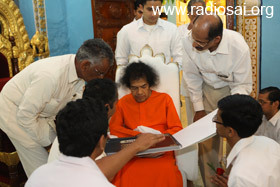 A second aarthi was taken after which Swami blessed some staff members from the hospital with Vibhuti. It was almost nearing 8 p.m. when Swami retired for the day.